FRIES, Laurent. Tabu. Nova Orbis. Lyons, 1535. Bloomsbury-London is offering 100 lots of historic maps during its Books and Maps sale, today, Tuesday, January 31, 2012. Amongst the many cartographic beauties, primarily regional and national, are six world maps of artistic and historical interest. Laurent Fries' Tabu. 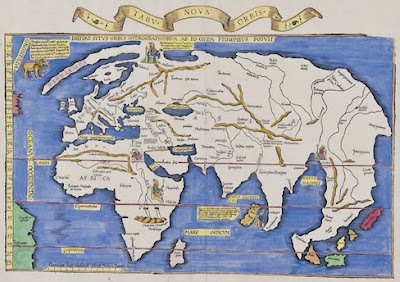 Nova Orbis (1535) is a woodcut Ptolemaic (geocentric) world map, later hand-colored, depicting Greenland as a long peninsula stretching from Scandinavia into the Atlantic Ocean. It features an elephant or mammoth at upper left, and five enthroned kings sitting in N. Europe, China, India, with two in Africa. The title banderole is unfurled at the top. ac Hydrographica Tabula. Amsterdam: Jan Jansson, 1641. 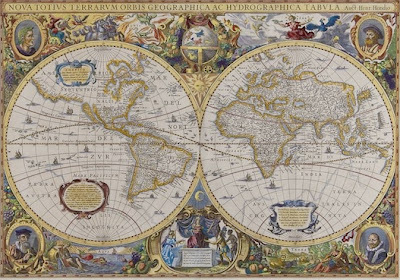 Henricus Hondius' Nova Todas Terrarum Orbis Geographica ac Hydrographica Tabula (1641) is an engraved, later hand-colored double-hemiphere world map showing California as an island and part of the north coast of Australia - put the shrimp on the barbie in Santa Monica, Mate. It features a small celestial globe at top, and four portrait medallions of Julius Caesar, Ptolemy, Mercator, and Hondius at each corner with allegorical figures of the four elements in between. ORTELIUS, Abraham. Aevi Veteris, Typus Geographicus. 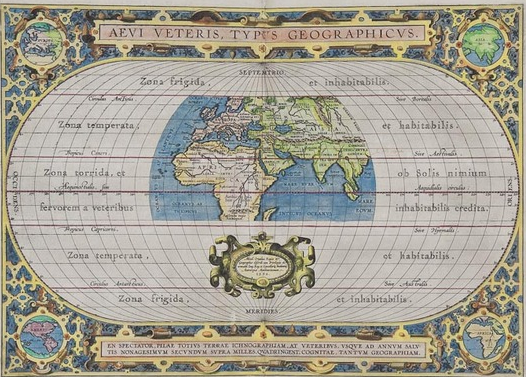 Aevi Veteris, Typus Geographicus (1592), by the great Abraham Ortelius, is an engraved and hand-colored classical world map within an elaborate strapwork border containing the title above and the four known continents in corner medallions. ROGERS, William. Double-Hemisphere World Map. 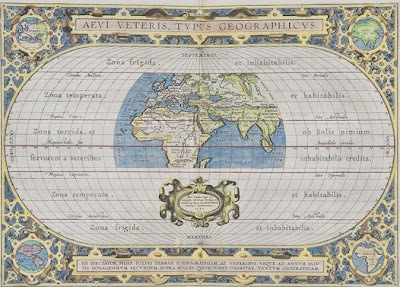 William Rogers' engraved and hand-colored Double-Hemisphere World Map (1598) possesses a strapwork surround and the name Iehovah at center-top. 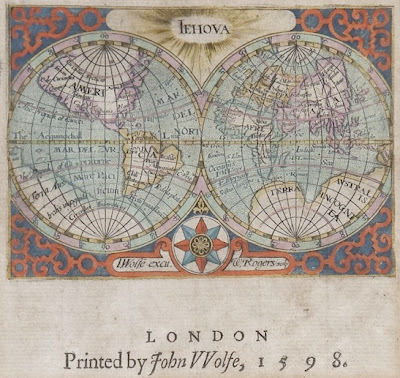 It was issued as one of the title pages to the 1598 English translation of Jan Huyghen van Linschoten's Itinerario (John Huighen van Linschoten, His discours of voyages into ye Easte and West Indies: devided into foure bookes). SCHEDEL, Hartman. Secunda Etas Mundi. 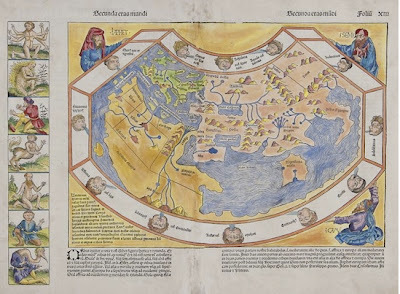 Secunda Etas Mundi (The Second Age of the World, 1493) by Hartmann Schedel (one of the first cartographers to use the printing press) is a Ptolemaic world map taken from the first Latin edition of Schedel's Nuremberg Chronicle, which featured the first maps of many cities and countries. 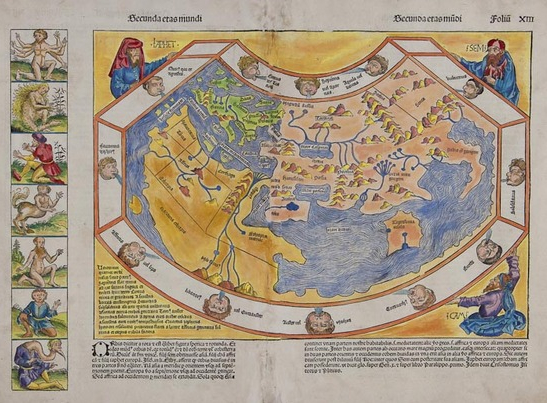 In later hand-colored woodcut, the map is surrounded by twelve headwinds, and supported at upper left and right and lower right corner by Ham, Seth, and Japhet of the Old Testament. At left are seven panels depicting strange and fantastical human beasts. in Plurimus Emendatus, Auctus, et Icunculus Illustratus. 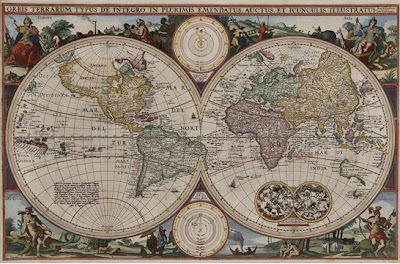 Orbis Terrarum Typus de Integro in Plurimus Emendatus, Auctus, et Icunculus Illustratus (1657) by Nicolaes J. Visscher, the Dutch cartographer most famous for his maps of New Netherland (New York), New England and the Atlantic Seaboard, is a hand-colored engraving, a double-hemisphere with California as a peninsula, and showing parts of the coast of Australia and Van Dieman's Land (i.e. Tasmania). Diagrams of the solar system appear at upper and lower center, and scenes with allegorical figures representing the four known continents illustrate each corner. Celestial spheres are featured in the right hemisphere at bottom, and descriptive text about recent discoveries is found in the left hemisphere. 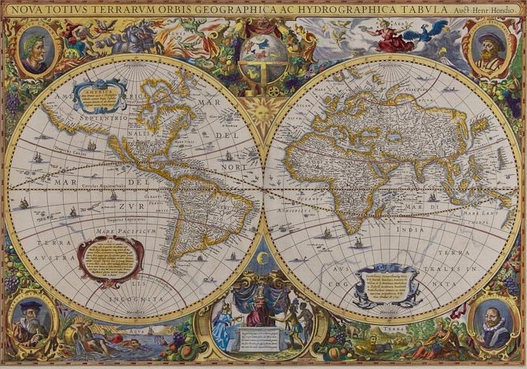 These are gorgeous maps, with estimates ranging from $400 - $550 (Rogers) to $4700 - $6300 (Hondius).